Chip, a Pixel Pals educational electronics kit, is the first in a line of beginner friendly products that goes beyond learning soldering skills. He can be incorporated into Arduino based projects as well as using the Pixel Power board in e-textiles. The kits are designed to be multifunctional, yet affordable. The first character, Chip featured in this Kickstarter campaign, focusses on LEDs and basic circuitry. Once soldered, it can standalone with the Pixel Power board and serve as a fun toy or light. Chip can also plug into an Arduino Uno Rev 3 or into a breadboard where Chip can be incorporated into more advanced electronic projects or programming lessons. Soldering Sunday created the Pixel Pals soldering kits to fill the gap between introductory and advanced projects. Each Pixel Pal will focus on a particular electronics component which will require soldering; but are Arduino compatible so that they can be programmed for other projects are used. The kits are also designed to be affordable for organizations and parents who want to encourage STEAM education but are hindered by the large price tag of many existing educational products. The Kickstarter campaign, if successful, will help keep the production costs down. November 3 to December 3, 2014. 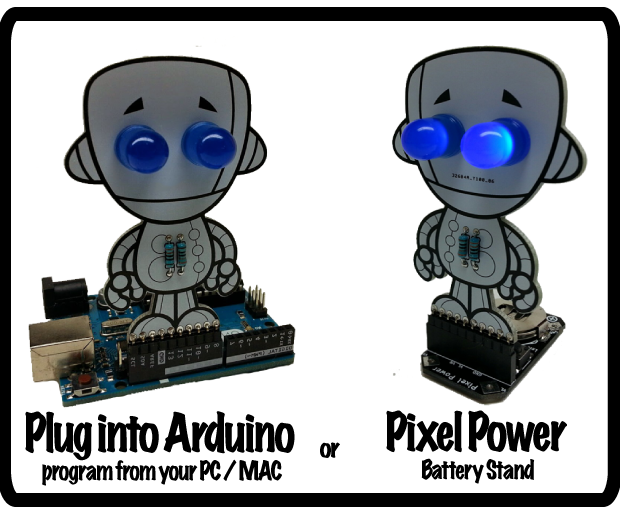 Also consider visiting the project on Kickstarter (www.kickstarter.com/projects/solderingsunday/chip-an-electronics-kit-with-character) donating $1 on Kickstarter to receive updates. Dieser Eintrag wurde veröffentlicht in Crowdfunding, Development, Education & Studies, English, Fun, General, Hardware und verschlagwortet mit Education & Studies, electronics, Hardware, Learning Tool von Sebastian Trella. Permanenter Link zum Eintrag.